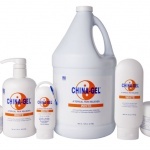 September 15, 2012 — China–Gel Inc. has added to their Topical Pain Reliever line by introducing a convenient Two Ounce Travel Tube 2 GO. The tube features the original China-Gel formula and a handy clip, so the tube can be attached to a bag, purse, athletic bag or anything else. The Travel Tube is a great size for chiropractors and massage therapists to retail to their patients. Imagine the conversation in the office or at the game when a patient displays the China-Gel Travel Tube. Talk will eventually wind up with ‘where did you buy that?’ resulting in a discussion about the practitioner’s services, making the Travel Tube a marketing tool that promotes the practice and care for the patients.